As is the custom when beloved Adventures in Odyssey actors pass away, the Odyssey team has put together another tribute podcast for one of AIO’s best. We reported last month that Dave Madden, voice of Bernard Walton, passed away at the age of 82 on January 16, 2014. And now, less than a month later, the Odyssey team celebrates their friend via a tribute podcast in his honor. 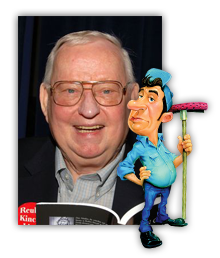 The latest edition of the Official Podcast celebrates Dave Madden’s contributions to Adventures in Odyssey during his long run with the series. Plus, you’ll hear from a variety of actors, sound designers, and writers as they share their memories of Dave. It’s a very sentimental podcast you won’t want to miss!